I originally believed that Britain should "Remain" in the European Union. 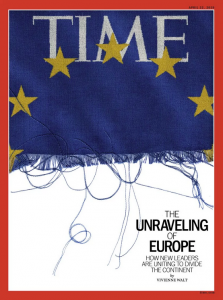 It seemed to be too destabilizing to "Leave" when we (The US and the rest of the world) need a cohesive set of allies in Europe, fighting terrorism, helping solve the refugee problem and holding struggling nations together so they do not also "Leave" and become fertile ground for chaos and/or tyrannical government takeovers. Now, giving a more detailed analysis of the situation after the vote to "Leave", my view has changed. Here are thoughts captured from various discussions, commentary and public debate. There are no guarantees "Leaving" the EU will turn out to be a good decision. Every trade agreement in existence will have to be renegotiated for example. There will be a “void period.” A time of uncertainty and volatility. Who will do what, when is, as of right now, a complete void. But, the choice to "Leave" was a bold one, based on what is best for the people of Britain and the rest of the UK. A better solution for the UK to "Remain" apparently could not be created that would benefit the UK in any way close the the decision to "Leave". David Cameron realized this and did his best to negotiate such a solution, without success. And President Obama's scolding direction to "Remain"may have been the meddling that pushed voters over to the "Leave" side. Or, was it Elizabeth Hurley's opinion. The British were fed up with immigration and the cost to support other members of the EU. They would rather have uncertainty about the future than to live in the present they so clearly saw. Open immigration allowed no time for absorption of values. The flood of people is overwhelming them. They saw their way of life changing right before their eyes. EU is a socialist style, economic redistribution scheme run by faceless, unaccountable bureaucrats. The decision to "Leave" was about Democracy. Brits want change. Return of Great Britain to the world stage. This will advance prosperity, freedom and liberty, principles which Americans value highly. The perception of EU high-handedness is what alienates public opinion across the European Continent. Brexit ought to be the wake-up call the EU needs to return to serving as a common market that encourages growth and competition, and not—as it has become since the late 1980s—an innovation-killing superstate, obsessed with regulatory harmonization, tax hikes, green-energy dogma and anti-competitive antitrust enforcement. There just might be a domino effect over the next months and years, especially if Britain does not suffer the economic and diplomatic catastrophes forecast by the "Remain" camp. Scots are the most pro EU. If they leave, they would have to apply to join the EU and NATO. Spain has said they would veto that, which would leave Scotland alone. Brexit may encourage other states—the Netherlands is often mentioned, and Norway and Switzerland have shown it’s possible to have prosperity and security in Europe with less nannying by Brussels. A YouGov poll conducted in the run-up to the British referendum showed that the vote for Brexit was very much one of the old against the young. The older the voter, the more he or she was inclined to leave. Some 64 percent of the age group from 18 to 24 said they would vote for Remain; just 35 percent of those between 50 and 64 wanted to stay. The greatest danger to post-Brexit Britain is that it will lead to a new era of parochialism in U.K. politics. The threat of Scottish secession is another, which could become acute if Brexit leads to recession or higher taxes. On the positive side, having declared their independence from the EU, the British people can now show the world what a determined democracy can accomplish. David Cameron Calls for More Local Powers Across U.K.